Most adolescents and teens spend a period examining their families, if not with outright horror, then at least with a cautiously raised eyebrow and quiet head shake. Some look around and see what they think are normal, stable families and wonder why they got stuck in such a weirdly dysfunctional mess, so they start looking for ways to get out. They spend more and more time with their friend's families, trying to wedge themselves in as a another sibling, hoping if they're around enough, the friend's parents will eventually forget they are alien spawn and raise them as their own. We humans have been doing something similar in our own solar system family. The more we look around, the more despondent we get. There aren't really Moon Maidens living on Luna. Mars has failed to produce the canal riding Martians promised by Percival Lowell and Giovanni Schiaparelli, or even the cool, yet mortal bullies created by H.G. Wells. As we understand more about our stellar family we finally have to admit there are no planets where we can go and live comfortably and no other intelligences we can talk to, so like those embarrassed and eye-rolling teens, we look around for something better. Maybe if we're lucky, we can marry into a better family, like maybe 55 Cancri or Epsilon Eridani. Our human imaginations have conceived amazing interstellar families with Vulcans, Sandworms and Schlock Mercenary. They have to be out there, right? Sure, they might be, but as we mature, we're also starting to see that no matter how horribly boring and strange our family is, we're probably stuck with it. Our so-far-unique combination of imagination and knowledge may yet deliver wonders like cures for cancer, nanotechnology, bioengineered body sculpting, flying cars, smaller bikinis, robot house keepers and space elevators, but not an interstellar empire. No matter how much we want it or how many sulking tantrums we throw, technologies that can sidestep or warp the physical universe enough to bridge the staggering distances between stars aren't even on the horizon yet. That doesn't mean it will never happen. I, for one, have great faith in human ingenuity, but like honest politicians and a three day workweek, hyperspace and warp drives will most likely remain bright and shiny fictions for a very long time. So what do we do in the interim? Try to understand or at least accept the quirks and oddities of those we are stuck with? We actually have a great planetary family. Yes, the bigger siblings, Jupiter and Saturn, always get their way, but have used their impressive gravity to nearly sweep our Solar system clean of dangerous debris, making it a safer place for the little ones like Earth and Mars. Of course there is solemn and moody Venus who refuses to talk to anyone despite all of our efforts as well as distant twins Neptune and Uranus, who live lives that seem to have little to do with the rest of the family. But we finally have the opportunity to get to know the two oddballs: Mercury, now the smallest, and Pluto who, like a surprise on a soap opera, is actually a distant dwarf cousin, not really a member of the immediate planetary family at all. Earlier this year, Andy Calloway, Operations Manager for the MESSENGER mission to Mercury, invited me to tour the mission control center at John Hopkins Applied Physics Laboratory. I was more than excited and soon learned I was in for a double treat. Somewhere in the back of my mind, I'd known that APL also ran the New Horizons mission to Pluto, but was pleasantly surprised to find the control centers for both missions were right next to each other, sharing the same big room. Just for the record, they even look like space mission control centers! No, not the kind with pipe smoking, lab-coated scientists and monstrous machines sucking information from herky-jerky tape reels. This was a modern, technological paradise with banks of computer consoles and huge colorful screens high on the walls, and streaming cryptic telemetry displaying orbital diagrams. The scientists now wear jeans, and instead of pipes they pawed through fast food bags while they instructed and monitored our distant robot explorer called MESSENGER. 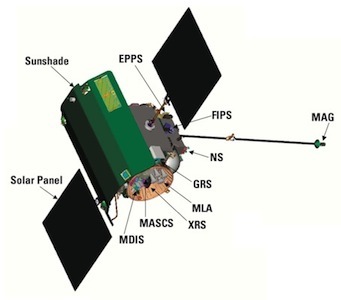 The MESSENGER probe was launched in August of 2004 atop a Delta II booster. Normally, we have to use enormous amounts of fuel or gravity assists to build the speed of a probe bound for another planet, but since Mercury lies deep within the Sun's gravity well, the mission planners actually had the opposite problem. MESSENGER was going to speed up rapidly as it fell toward the sun. So instead of carrying enough fuel for prolonged deceleration burns, they needed an Earth flyby and two Venus flybys to bleed off speed. MESSENGER also used those flybys as opportunities to test its instrumentation packages, including the cameras. Andy played an awesome video that MESSENGER took during its 2005 Earth flyby, which shows a slowly spinning and beautiful Earth receding rapidly into the blackness. Check the link here. An odd detail that stood out for me was the way the Sun reflected from our little world, making it look like a bright light shining from a colorful balloon or cloud-shrouded number two ball on a pool table. And I couldn't help but think that if a manned ship were leaving Earth at 24,000 mph, its crew would see that same view, but they would be filled with entirely different emotions. The conference room where we saw the video also contains a one-fifth scale model of the probe. One of the things that immediately stood out was the large sun shade. On the actual spacecraft, the heat-resistant ceramic cloth shade is two meters by two and a half meters and is kept constantly between the delicate scientific instruments and the brutal 850F sunlight. Though a very high tech material, it was a simple and elegant solution to the worst of the heat problems. I'm glad we've finally sent a probe to study the smallest member of our planetary clan. Mercury has held a certain allure for me since reading about those feisty Hermians in Clarke's Rendezvous with Rama. Humans colonizing a world made hellish by heat and radiation, to get access to its boundless mineral wealth, is reminiscent of the gold rush days and carries a certain heroic element that appeals to my love of exploration and adventure. But before we can expect to lure even greed-crazed miners to set up a colony there, we have to learn much more about Mercury. The MESSENGER mission is a major contributor to that goal. MESSENGER isn't the only probe we've sent to Mercury. The Mariner 10 mission was launched in 1973 and performed the first ever gravitational slingshot maneuver when it used a Venus flyby to put it in an orbit that allowed three passes by Mercury between March 1974 and March 1975. During that period it took 1,200 photographs and mapped 40-45 percent of Mercury's surface. It also discovered a faint helium atmosphere and strong magnetic field that suggested a dense iron-rich core. After its maneuvering fuel ran out, the mission controllers turned off the radio transmitter and parked it in orbit around the Sun where -- barring an unknown impact with a foreign body -- Mariner 10 still remains today. When asked about the most exciting moments for him so far in the MESSENGER mission, Andy said, "Two exciting points stand out. The first is when we received the first images in the control center in the middle of the night following Mercury flyby #1 – knowing I was the first human in history to observe these images and new terrain from the side of the planet that had never been seen before. The second was successful completion of Mercury Orbit Insertion, knowing that 6.6 years of cruise through the inner solar system were not for naught, and that we had a new mission with exciting science and mapping ahead of us. We were the first team to ever orbit a spacecraft around Mercury, and that is now permanently etched in history and cannot be taken away." Steely eyed and stoic scientists be damned, this is exciting stuff! Of these two strange planets, Mercury is by far the most innocuous; but even though at first glance it's rather benign, there are oddities that cause some head scratching akin to, say an adorable blond-haired, blue-eyed toddler brother who suddenly starts reciting poetry in a long extinct south Asian tribal language. One of the things we really wanted to know was how Mercury could have such a powerful magnetic field. It's the only rocky inner planet besides Earth that does. Sure, we already knew that it has a large mostly iron core, but that alone shouldn't have been enough. Earth's solid iron-nickel core rotates inside a sea of magma, which works like a gigantic electric motor. We thought Mercury might also have a molten core, but it was considered unlikely that such a tiny planet -- smaller even than the moons Ganymede and Titan -- could still be that hot after so long. MESSENGER has now settled into an 8 hour orbit that is still elliptical, its distance above Mercury ranging from 172 miles to 6,000 miles. This odd orbit is necessary because even though the probe has that awesome sun shade, heat reflected back from the planet itself is enough to overheat the delicate instruments. The MESSENGER ops team actually had to come up with a rather intricate schedule of cycling instruments on and off, depending where they were in the seasonal period, to keep them within their heat tolerances. The mission has already discovered several interesting things, the most amazing of which is a better answer to that magnetic field question. Mercury's iron core is closer to 85 percent of its entire mass instead of the long assumed 40-45 percent and does have at least a thin liquid layer. 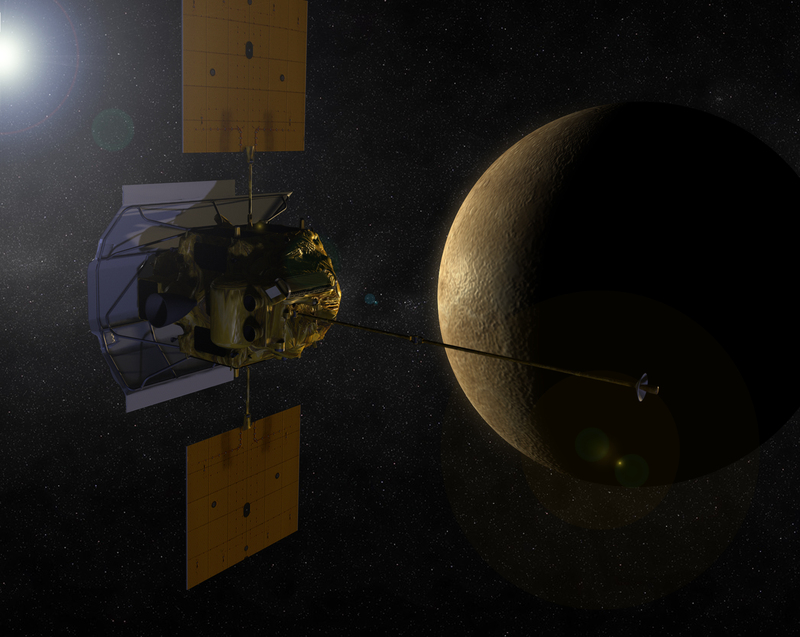 In this new orbital configuration, MESSENGER will also be able to complete the surface mapping, including the poles. This is important because Mercury has a surprising amount of water in its thin atmosphere and we expect to find significant water ice deposits in the deep craters at the poles. Why only the poles? Because Mercury does rotate. While it orbits the Sun every eighty-eight Earth days, it rotates around its own axis only once every six Earth months. The whole water vapor thing astounds me. If water ice is hiding on Mercury, it must be everywhere out there! These are all things those crazy Hermian miners will need to know someday, but since Mercury's meteor and comet impact craters have remained fresh for millions of years, documenting the chaos from the early years of the solar system, our littlest brother's biggest treasure trove may actually be a better understanding of the origins for the whole family. A few people are still sore about the whole Pluto demotion thing, but like any mysterious stranger who shows up and claims to be a long lost brother, his story is bound to be debunked as we learn more about him. To start with, when Pluto was added to the family back in 1930, we thought it was much larger. Early estimates for "Planet X" showed it equal in mass to Earth, but we now know its diameter is much smaller. Only 66 percent the size of our moon! We also didn't realize until recently that objects larger than Pluto lurk out there in the Kuiper Belt. Since the discovery of the more massive Eris in 2005, the International Astronomical Union has been under pressure to either demote Pluto, or add Eris and Ceres to the planet family. So the dwarf planet classification was established. Pluto being revealed as a diminutive cousin, rather than eccentric brother, may not be the last surprise reclassification either. Cousin Pluto and its largest moon, Charon, are actually planetary conjoined twins. They orbit around each other. This isn't unusual. Earth and our moon do the same thing, only their mass's common point of rotation, or barycenter, lies within the Earth's circumference. But since Charon is over half Pluto's diameter, their barycenter lies in space between them, making it much more obvious. And also unlike the Earth-Luna pair, Pluto and Charon are tidally locked together, so no matter how long they dance, they can never check out their partner's booty. We should all rejoice that Pluto was taken from the list of main planets. If the IAU ever agrees on the precise wording of the definition, the odd pair will eventually be classified as binary dwarf planets and most likely renamed Pluto/Charon. Third graders might be able to memorize that for tests, but many adults I know will never get it. I didn't see a scale model of New Horizons probe while at APL, but one of the large screens in the control center showed a 3D animation of the spacecraft rotating on its axis. Since the probe was in "cruise mode" and sleeping while I was there, there wasn't much more to see, but another screen displayed a course plot with a progress marker. This really brought the scale of the whole mission into focus for me. Even though New Horizons holds the record for the greatest launch speed at 36,373 mph as it left Earth (not the fastest spacecraft ever -- that record is still held by Helios 2) in January of 2006, it's still only halfway there. By halfway, I mean in distance, not time. Since the massive boost away from Earth, a gravity assist from Jupiter increased New Horizon's speed to about 47,000 mph, but it's still three years away from the closest Pluto approach. And the Sun is actually slowing it down, trying to drag it back, so now out between the orbits of Uranus and Neptune, its current speed has dropped to around 34,000 mph. It will be traveling at 30,000 mph when it passes Pluto. 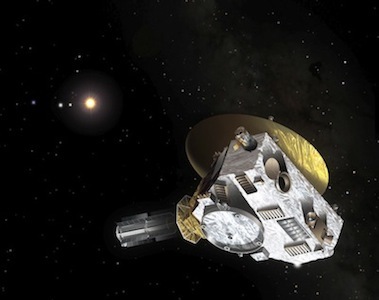 Unlike the MESSENGER mission that will orbit Mercury, mapping and studying for years, the New Horizons probe will have one chance. A single high-speed flyby. The science mission to Pluto will begin in February of 2015, when they start taking regular long range pictures. The actual flyby will be the middle of the following July. They will be in range for most of the instrument package to work for only about six days. I won't list all the mission objectives, but they include high resolution mapping, multiple tests to determine exact size, mass and composition and a look for rings and more moons. At the time of this writing, Pluto's fifth moon had just been discovered. 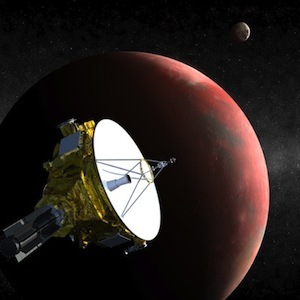 This is exciting, but also raises some concerns for the New Horizons mission. There's no real chance of the probe colliding with these new objects, but each moon has the potential to increase the amount of Trojan asteroids and other orbital debris in the Plutonian system. The New Horizons probe impacting even a BB-sized object at such speeds would spell disaster for the mission, so -- depending on the analysis of these new moon orbits -- the team might need to increase the closest approach distance between the probe and Pluto, which would decrease the effectiveness of many tests by at least some degree. Once the mission was approved, there was great urgency to get New Horizons launched on time. Pluto's highly inclined and weirdly elliptical orbit takes 248 Earth years to circle the sun. At its closest approach in 1989, it dropped closer to the sun than Neptune does. This approach heated Pluto and changed its atmosphere. We don't know how much of a change there was, but the atmosphere appears to be rather complex and deep, at least 62 miles thick. Some signs indicate that it is now acting as a cometlike tail pointing away from the sun. Of course Pluto is currently on its way back out to deep space and speeding further away from us. Since the mission planned to use a gravitational slingshot around Jupiter to build speed, every day of delay put Jupiter in a worse position. The launch was delayed by two days -- if even a couple days had been added to that wait, it could have added years to the mission -- but now the spacecraft will arrive in plenty of time to analyze the atmosphere. We may not have another chance until it comes in close to the Sun again 200 years from now. As if having a weird orbit and being a binary dwarf planet isn't enough, Pluto may turn out to be even more interesting. Scientists believe it might have a dense solid core surrounded by an icy mantle. If the heating at the core is still active, Pluto could actually have a liquid water layer 50-100 miles thick between the core and ice mantle. Who knows, we may have been looking in the wrong places for life in our solar system. Chances are slim, but there may just be colonies of sea monkeys living beneath Pluto's ice, waiting to perform their own rendition of Fernando for us. Like a relative traveling cross country and stopping to see each cousin and widowed aunt, New Horizons is a good example of a multipurpose mission. On its way through the asteroid belt it flew within 102,000 miles of 132524 APL on June 13, 2006, taking pictures and confirming that it was an S-Type asteroid. The probe also made an intensive four-month study of the Jovian system as it passed by during the gravity assist. With the advanced cameras and instrument package, it took some of the best pictures and measurements yet of the big brother planet. The probe actually returned more information about Jupiter than it's expected to glean from Pluto. And New Horizons will still be exploring even after its primary mission of visiting Pluto. The mission planners intend to redirect the probe to make close passes near one or two Kuiper belt objects in the eighteen to thirty mile diameter range that lie near the probe's trajectory. So be expecting some out of town company, Uncle Alfonso. Unless someone comes up with a warp drive in the near future, humanity will be stuck with the stellar family we were given. But maybe -- like many embarrassed teens from less than idyllic families -- if Earth gets to know little brother Mercury and weird cousin Pluto a little better, we may find that our family's quirks actually make it rather interesting. And who knows, with water ice on Mercury and a possible liquid water ocean under Pluto's mantle, we may not be as alone as we thought. William Ledbetter lives near Dallas with his family and too many animals. A Writers of the Future award winner, Bill is also a consulting editor at Heroic Fantasy Quarterly and Quantum Kiss ezines. He is the administrator of the annual Jim Baen Memorial Writing Contest for Baen Books is responsible for the contest’s affiliation with the National Space Society.